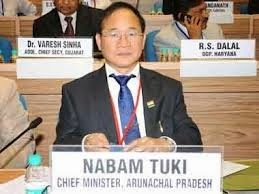 Itanagar, May 19 : Veteran Congress leader Nabam Tuki was sworn in as the eighth chief minister of Arunachal Pradesh for the second consecutive term. Governor Lt. Gen. Nirbhay Sharma (Retd) administered the oath of office and secrecy to Mr Tuki in an impressive function held at Darbar Hall of Raj Bhavan here. Most of the newly-elected Congress MLAs, Arunachal Pradesh Congress Committee (APCC) president Mukut Mithi, AICC general secretary (in charge of Arunachal) Luzhino Faleiro and high-ranking government officials were present in the ceremony. Later talking to reporters after the swearing in ceremony, Mr Tuki said that his government’s priorities would be on youth development, improvement of road and telecommunication in the state and to execute all ongoing projects on time. “My government will focus more on the development of health and education sectors besides agriculture and its allied sectors and duty bound to provide jobs to the unemployed youths through various initiatives,” he said. Moreover, he said providing security to the people of the state and improvement in the law and order would be another focus area of the new government. “To ensure security to the people the government will deploy 24x7 PCR vans in the state capital as well as in all district headquarters to control crime and criminals as promised in the party’s election manifesto,” he said.